One of my biggest travel dreams is to drive the California/Oregon coast, and it's books like this one that continues to whet my appetite for travel. I imagine I might stop at places like the Big Sur Inn, places I've either read about or saw in a movie once. Places that plague the memory from time to time. 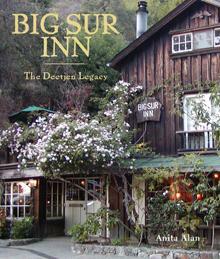 Big Sur Inn came about because of the vision of a Norwegian named Helmuth Deetjen and his wife Helen Haight. Their love of this part of the world manifested itself in the form of the inn which has seen its share of travelers and passersby. Author and photographer Anita Alan knew the Deetjens and stayed at their inn many times, and this book comes across as a deeply personal tribute to a time and the history of two friends and their dreams. There are old photos illustrating very interesting text, as well as more recent pictures of the people, the inn, and the surrounds. There are also poems ushering you into and out of each new chapter. Alan says about the building of the inn: "The Deetjens undertook the impossible. They set about building a place as unforgettable as its surroundings, a place of spiritual and physical renewal. This they did with little but resourcefulness and love." Perhaps that's why it's been such an enduring attraction for many people, year after year. Helmuth Deetjen was sophisticated, well traveled, well read, a conversationalist, an intellectual, and a hardworker - a great combination that led to many interests and a busy and productive life. His life is an interesting read, as are the many stories of others connected to this alluring establishment. Conclusion - A great read. Very interesting and an enchanting story.